Bridget is a warm, engaging and professional counsellor and psychotherapist with 20 years’ experience in therapeutic work of various kinds. 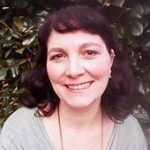 She has experience of working with many issues such as depression, anxiety, self-harm, trauma (PTSD) and bereavement, however, as a humanistic practitioner, she always works with an individual’s unique experience. She works with both adults and teenagers and is passionate about adolescent mental health, and offers the opportunity to use creative therapeutic appraoches. Although counselling is traditionally called ‘the talking cure’, it is usually feeling heard that unlocks the door to our personal healing. Her approach integrates the theories of Gestalt, attachment, transpersonal approaches and EFT. Qualifications: BA (hons) Counselling and Psychotherapy (1st class), Registered Member of the BACP and counselling tutor at Guildford College. To contact Bridget McConnell, call 01483 418103 or email us.